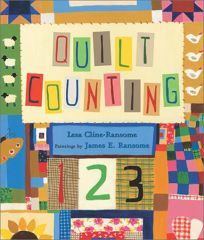 Children count to 10 and back in Quilt Counting by Lesa Cline-Ransome, illus. by James E. Ransome. This follow-up to Quilt Alphabet celebrates the ways in which a quilt (""a legacy handcrafted"") stitches together the generations of a farm family and, in turn, exemplifies their love for the land. Ransome's luxuriant palette exhibits Matisse-like intensity.